This gelding started out in the jumpers, and has shown up to 1.20m. He has recently been showing in the 3'3" Amateur Owner Hunters consistantly along with the 3'6" Performance Hunters. 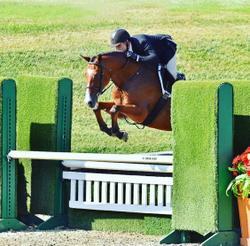 He has a lot of miles competing at WEF, Tryon, HITS Saugerties, and Monmouth at the Team. If you are looking for a horse to do the 3'3"-3'6" hunter divisions, this would be a great one for you. I would like to let you know that Royal Holiday has been sold. Your site was really a huge help to us - we got so many calls! Thank you again!! !